When Amazon launched its $199 connected speaker Amazon Echo last month, which plays music, news, radio and more as well as respond to commands and queries via its included virtual assistant technology, it also came with a dedicated mobile app for configurations and other settings. The app was initially available only for Amazon’s Fire OS and Android, but not iOS. Instead, iPhone and iPad users had to use Safari or a desktop browser instead. Today, that changes as Amazon has now released Amazon Echo for iOS. Like its Android counterpart, the new iOS app allows you to use your iOS device as a remote control of sorts for interacting with Echo. To get started, the app guides you through a simple set up process, after which you can use the app to control the output to Echo as an alternative to using voice commands. The app lets you manage a variety of settings supported by the connected speaker, including your alarms, music, shopping lists and more. It offers a basic music player as well that lets you see what’s playing, what you’ve played recently and what’s in your queue, while also offering player controls that let you play, pause, rewind, fast forward, shuffle and repeat. 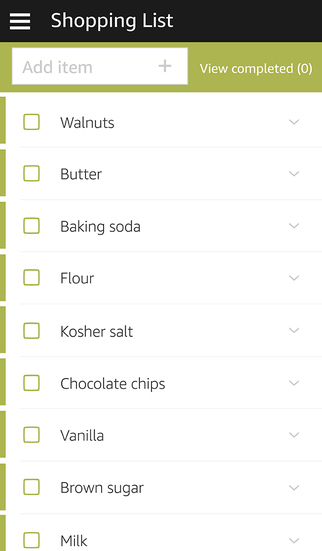 The included shopping list interface is also fairly simplistic, allowing you to add or remove items, or check them off. Additionally, the main screen of the application shows you weather and other recent queries, including those Echo has looked up on Wikipedia on your behalf, which is one of the hardware device’s more interesting functions. Amazon Echo, as a reminder, is not yet broadly available. Instead, interested users can visit the Echo website an request an invitation to purchase the device. The issue here is not likely whether or not Amazon can manage to produce enough hardware to fulfill demand – but rather whether there will actually be demand. After all, Amazon’s entry into the smartphone market with Fire Phone flopped, and Echo is at best a shopping assistant not, you know, a Samantha. (Or Alexa, as Amazon has named its virtual helper.) As with its other hardware-based shopping assistant Amazon Dash, the company is basically running its hardware consumer trials in the open to see how people respond. Amazon Echo for iOS is a free download here.